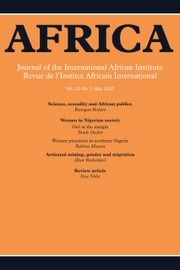 Africa is the premier journal devoted to the study of African societies and culture. Editorial policy encourages an interdisciplinary approach, involving humanities, social sciences, and environmental sciences. Africa aims to give increased attention to African production of knowledge, highlighting the work of local African thinkers and writers, emerging social and cultural trends 'on the ground', and links between local and national levels of society. At the same time, it maintains its commitment to the theoretically informed analysis of the realities of Africa's own cultural categories. Each issue contains six or seven major articles, arranged thematically, extensive review essays and substantial book reviews. Special issues are published annually. The aim of this strand of the journal is to introduce and analyse texts – whether oral, manuscript or print – produced by authors outside the literary or academic mainstream. Such texts might include notebooks, diaries, letters, local works of history, philosophy or literature, performed or written poetry, newspaper serials and a host of other forms. This rich seam of intellectual work is increasingly becoming a focus of attention by historians, anthropologists and literary scholars. Texts such as these constitute an archive of local thought and experience, experiment and commentary. They shed a fascinating light on life ‘on the ground’ in Africa, past and present. But the texts themselves are rarely accessible outside the local context of their production. As the series develops, the journal will be building up an on-line repository of texts to which scholars and researchers can return over the years. The preferred format is an introductory essay of approximately 5000 words and a sample text (with translation if relevant) also of approximately 5000 words, for the print version of the journal; plus a longer text – there is no formal word limit – appropriately edited and annotated by the contributing scholar, for the online archive. In the published list of articles below, local intellectuals' texts are included as 'Supplementary Materials' which can be accessed from each article page by clicking the 'Supplementary Materials' tab.